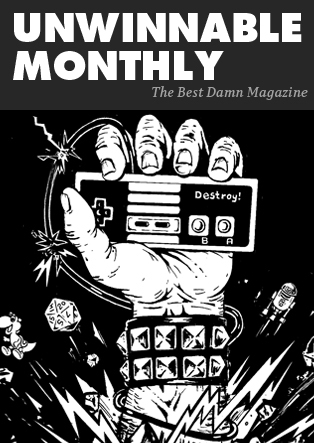 This article is a reprint from Unwinnable Monthly #80, the Kid Adventure issue! If you like what you see, grab the magazine for less than ten dollars, or subscribe and get all future magazines for half price. I’ve been meaning to write about the material accidents of playing old videogames, especially since digital distribution of games remastered to play on current systems can seem to erase the particular physicality of older games. This month for example, I found myself playing a pair of PlayStation 2 sci fi flight combat simulators largely because one of them was released digitally on PlayStation 4. When I start up Star Wars: Jedi Starfighter on my PS4, even though it flashes a PlayStation 2 banner on the screen and offers the familiar PS2 interface, right down to the constant stream of messages telling me that “the game is saving data to the (nonexistent) memory card,” I’m holding a DualShock 4 controller and staring at a TV that’s easily four times larger and sharper than the one I originally played Jedi Starfighter on in 2002. It’s kind of glorious. There are occasional compromises – the Dualshock 2’s Start button has been replaced by a click to the right side of the touch pad – but in practice, the experience seems to blur the line between playing on a modern system and playing on the original version. This is, the game seems to want to say, how it was all along behind your imperfect screen. On the other hand, I played Jedi Starfighter’s 2001 predecessor, Star Wars: Starfighter using a slimline PlayStation 2 with a wired controller on a CRT TV. I’m not a purist, but playing pre-HD consoles on HDTVs can be genuinely unpleasant. Playing games on old systems can sometimes feel like putting on a pair of dirty glasses and I’ve found that digital TVs make things worse. I don’t have the technical expertise to declare this an objective rather than subjective phenomenon, but it was bad enough that I tracked down an old tube TV someone was getting rid of before playing through Eternal Darkness. Yet I still find myself sitting in front of the sofa with a wired controller thinking, “Is this really how we used to play games?” I am, apparently, rather spoiled. I’m not entirely sure how to sort this out yet. It’s useful, at least from a critical perspective, to be able to compare the physical experience of playing a game on its original system to the updated version. That said, I can’t necessarily recommend it for its own sake. Jedi Starfighter looks better on PS4, especially on a bigger screen. I like the freedom and convenience of a wireless controller. I’d prefer to be able to load my PS2 disc into a PS4 instead of having to pay for a game I already own, but that didn’t seem to stop me from opening up my wallet. Backwards compatibility would be much better than relying on publishers to decide which older titles do and do not receive re-releases on new hardware, but I’ve purchased enough re-releases of titles I already own to have to consider myself as part of the problem. For now, I’ll settle with the two games I have. Jedi Starfighter, good fun in 2002, is still good fun in 2016, maybe because LucasArts has a long history of good flight combat simulators, but maybe because the game really doesn’t have that much connection to the still-nascent prequel universe. Starfighter and Jedi Starfighter mostly revolve around a gruff Feeorin pirate named Nym. In the first game, Nym’s adventures put him in contact with a Naboo Royal Space Fighter Corps pilot named Rhys and in the second he meets the Jedi Adi Gallia. In practical terms, this is just an excuse to give the player a couple of different space ships to fly and, even though the end of each game feels a need to give a nod to the climactic battles from The Phantom Menace and Attack of the Clones, the lack of a fleshed-out connection is really all for the better. As a story, it’s hard to maintain investment in a war between two disposable armies. As a videogame, on the other hand, there’s a certain pleasing symmetry between design and story context when the player is asked to destroy droids via ingame AI algorithms. If adhering to Star Wars lore were the primary consideration, then offering force lightning as a secondary weapon for Adi Gallia’s prototype Jedi Starfighter would be something of a problem. Force lightning in the films is a Sith power, linked directly to mastery of the dark side of the force. But in Jedi Starfighter, force lightning is probably the single most satisfying tool in the player’s arsenal, destroying multiple enemies as it arcs from ship to ship. In a perfectly faithful Star Wars environment, someone like Yoda might warn me to question my fondness for such a powerful weapon. Quicker, the dark side is, easier, and more seductive. Then again, Yoda isn’t in this game, so he can stuff it.